Working with street artist and Mangchi band member David Choe to design this unique album cover, Aoki spins this addictive tune into a hard-hitting late night warehouse anthem. Channeling his inner future-house roots from previous singles like “Dope Girlz,” and “ILYSM,” the Dim Mak label-head has remixed this track just in-time for his summer shows. 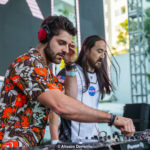 Earlier on this year, Aoki debuted the 2017 edition of his Dim Mak Collection line, showcasing a selection of street-wear designs including contributions from Choe himself. Encouraging more hints of future a collaboration, Mangchi performed at the fashion show, fusing art and music into one ground. Continuing to combine artistic efforts, Choe designed the artwork for the single including his signature Munko whales, leaving listeners to view his wildly imaginative creations in relation to this song.